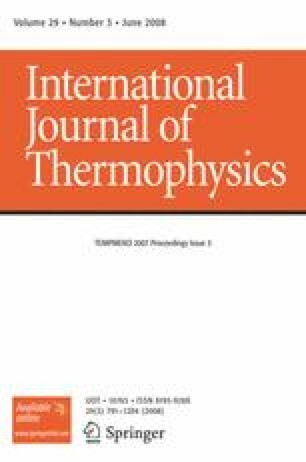 A miniature metallic cell for the water triple point (TPW, temperature 273.16 K) was developed for capsule-type thermometer calibrations for realizations with adiabatic calorimetry techniques. The LNE-INM/Cnam previously developed a copper cell for the water triple point and the techniques for cleaning, filling, and sealing. On the basis of previous work, a new copper cell prototype for the TPW was developed and filled at the LNE-INM/Cnam. Measurements were performed using an appropriate calorimeter and a comparison block containing several thermometers. Preliminary results show a scatter of the temperatures measured at the phase transition of the order of 0.2 mK when measurements are repeated over a short-term period (1 month). A positive drift in the phase transition temperature of about 30μK·month−1 was observed over several months. Studies are in progress to improve the cell, to reduce the reproducibility uncertainty to less than 0.1 mK and to have a phase transition with better temporal stability.